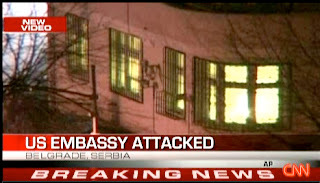 Group News Blog: BREAKING NEWS: U. S. Embassy under siege in Belgrade, capital of Serbia. 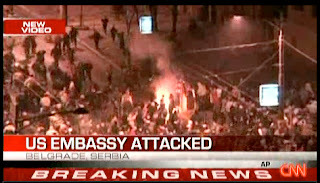 BREAKING NEWS: U. S. Embassy under siege in Belgrade, capital of Serbia. Very unnerving news and photos of a mob of several hundred thousand protesters marching, and then summarily overrunning the U.S. embassy in Belgrade—which they are now looting and setting ablaze in protest of the U.S.'s backing Kosovo's declaration of independence this week. (CNN) -- Violence broke out Thursday as tens of thousands of Serbs protested Kosovo independence and reportedly set fire to the facade of the U.S. embassy in Belgrade, according to news agencies. 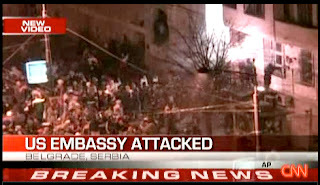 Riot police fired tear gas at Serb rioters as protesters wearing masks broke into the embassy. U.S. State Department spokesman Sean McCormack said; "We are in contact with the Serbian government to ensure that they devote the appropriate assets to fulfill their international obligations to help protect diplomatic facilities in this case." The embassy was closed and not staffed, a U.S. official told CNN. The United States was among the first countries to offer official recognition of independent Kosovo. Serbian Prime Minister Vojislav Kostunica, who earlier addressed the rally, said "Kosovo is Serbia's first name." He called the declaration of independence last Sunday illegal and said will do all he can to get it annulled. What a lovely second term, eh, President 19%? Meanwhile, Vladimir Putin cracks his knuckles as he laughs his gangster's laugh at the events playing out as he wanted it—Russia and China oppose Kosovo independence—while an ineffective U.S. State Department loads important files on flash drives and books the hell up out of downtown Belgrade. Annnnnd....to cap things off, a protester climbed the embassy roof and ripped down the American flag. Bummer that this is occuring so inopportunely—it's probably interrupting our beloved President's nappy-time. 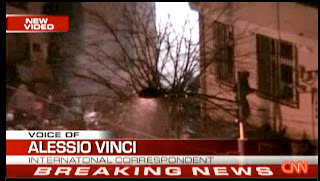 And reports are that Condoleezza Rice is headed to the region to offer her assistance in quelling the unrest. Which means that the city'll probably be in smoldering ruins by Monday. Ten. More. Months. Good God.